The closest Tohoku Shinkansen stations to the Towada Art Center are Shichinohe-Towada Station and Hachinohe Station. Buses run from both stations and arrive in front of the Towada Art Center. JR Oirase-go bus service will be suspended through Friday, April 30, 2018. More information is available on the JR Bus Tohoku website. The bus will, however, operate on the following select dates. Please contact JR Bus Tohoku for more information. Approximately 45 minutes by car. Approximately 20 minutes by car. Misawa Airport is the closest airport to the Towada Art Center, but central Towada is also accessible from Aomori Airport. 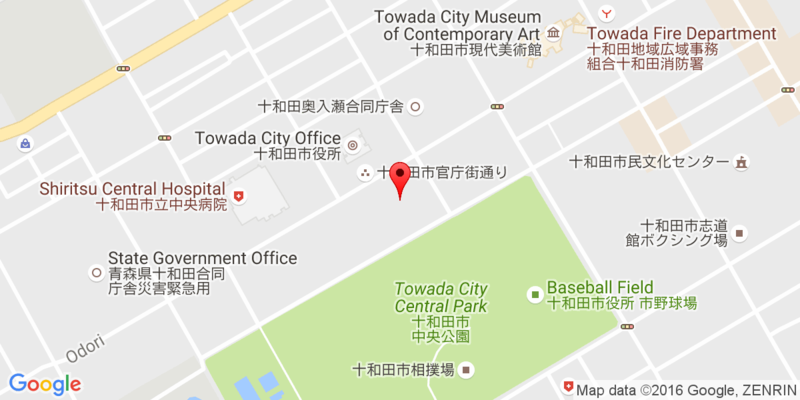 Convenient and reasonable share taxis are available from Misawa Airport to the Towada Art Center. Tohoku Expressway → Hachinohe Expressway → Momoishi Toll Road → Get off at the Shimoda Momoishi Interchange (IC) and take Route 45 to Route 102 → Take Route 102 approximately 20km to reach the Towada Art Center. *The Towada Interchange (IC) on the Tohoku Expressway is not the closest interchange to the Towada Art Center. Akita Expressway → Kitakami Junction (JCT) → Merge with the Tohoku Expressway and follow the same directions as those from Tokyo and Morioka. Alternatively, take Route 103 to Lake Towada and turn onto Route 102. Drive through the Oirase Gorge and into central Towada. *The Towada Art Center is approximately 45km from the Yasumiya area on the banks of Lake Towada. *The Towada Art Center is approximately 60km from central Aomori. From late April to late November, you can also take Route 103 or Prefectural Road 40 from Aomori over the Hakkoda Mountains to central Towada. From late April to late November, you can also take Route 102 through Kuroishi and turn onto Route 394. Take Route 394 past Jogakura Bridge and Sukayu Hot Springs and turn onto Route 103. Take Route 103 into central Towada. Parking near the museum is limited. Ten parking spaces are available directly behind the museum. 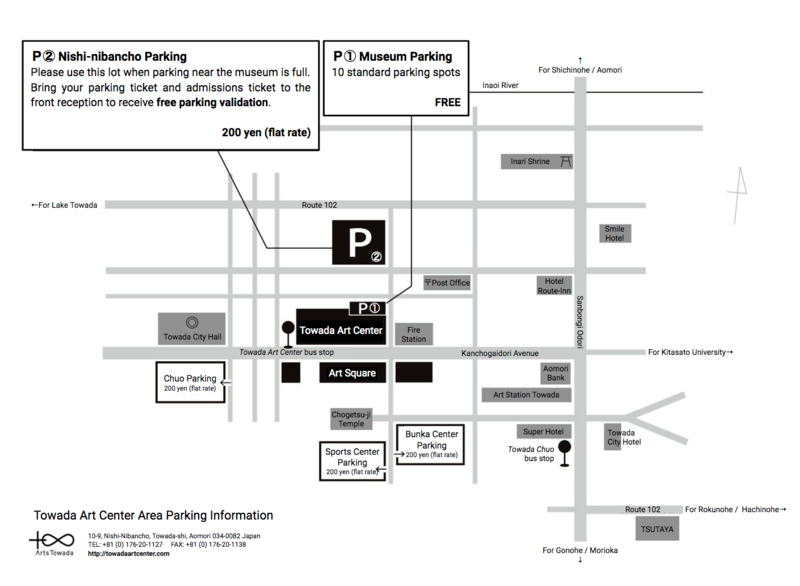 Paid parking options around the museum are listed below. 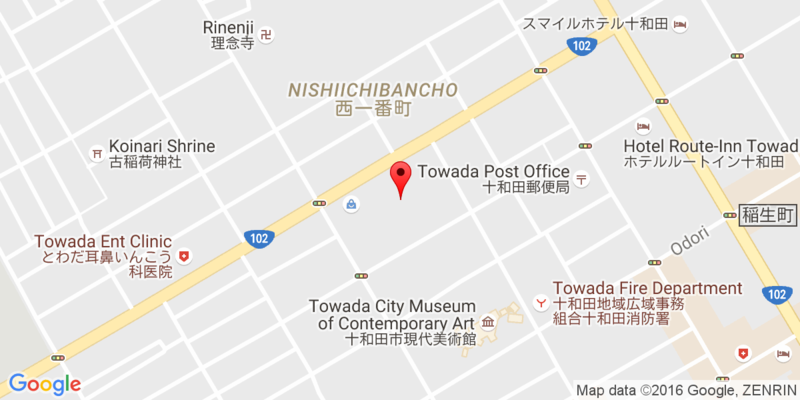 *The Towada Art Center validates Nishi-nibancho Parking for museum-goers. Bring your parking ticket and admissions ticket to the front reception to receive validation. Please refrain from parking in reserved parking areas near Nishi-nibancho Parking. Board a Towada Kankou Dentetsu bus at either Tokyo Station or Ikebukuro Station. 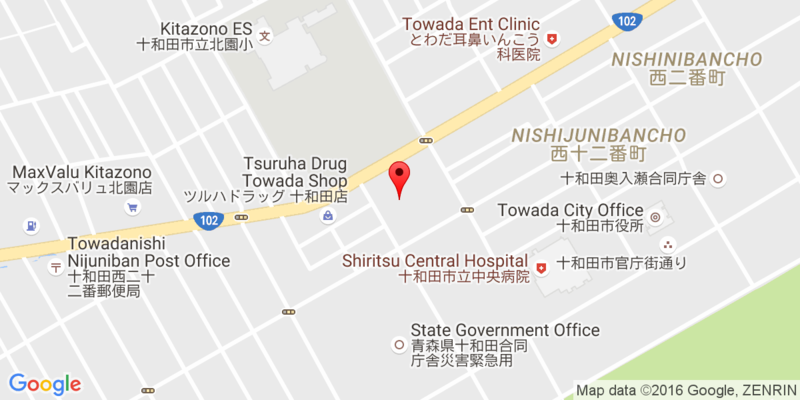 Get off at either the Towada Fujiya Hotel stop or the Towada Chuo stop.